A tour of the Royal Albert Hall, which opened in 1871 with a bad echo that was never fixed until 1969 when they finally figured out how to get rid of the echo: hang mushroom-like things (acoustic discs) from the dome. Talking to two large men dressed in drag who were in full black Victorian-era dresses just to be out on the town – no real special reason. (sorry, no picture). I asked if it was difficult to get around with the large hoops at the bottom of the dresses and they said not really and that people really get out of their way when walking down the sidewalk. Visiting the Science Museum, and specifically Charles Babbage’s Difference Engine (I saw it 3 years ago with Daniel and Angelina) and his brain, or at least the right side of it. And finally, a night of comedy with Anne. Yes, it ended up being a rather educational and interesting weekend. Walking down Fleet Street is a bit like an outdoor museum, which includes St. Bride’s Church – it was the inspiration for the layered cakes we’re all used to seeing at weddings. Click the pictures to see my highlights from today’s walk. Yes, I had rain and sunshine. Have you ever wondered what I’ve done for the last 15 years at Microsoft? I just explained it on my work-related blog if you are curious. 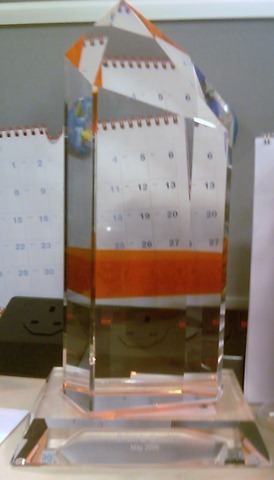 The thing pictured here (poorly) is my 15-year award sitting on my desk in London. It is a large chunk of glass with some orange colouring on it. We spent our birthdays in Munich being tourists by going to the Augustiner Bierhall and the Hofbräuhaus for traditional Bavarian food and beer. We also tried Mexican food in Munich, which turned out to be pretty good. The best part of our long weekend was touring the area on the way to Neuschwanstein Castle with Mike’s Bike Tours (but didn’t get any bikes at this time of year). We had beautiful weather all day, so it was a great time to see the countryside. We didn’t get in any skiing, but we did see snow as we cut through part of Austria. Maybe next time!